US education expert Rita Ferrandino believes we have a great opportunity; that EdTech is going to play a large role in the retraining and redefining of students of all ages now and into the future. Rita shared with EduGrowth her expertise as a STEM education expert, an expert on US education policy and politics and as a successful EdTech strategist and investor. 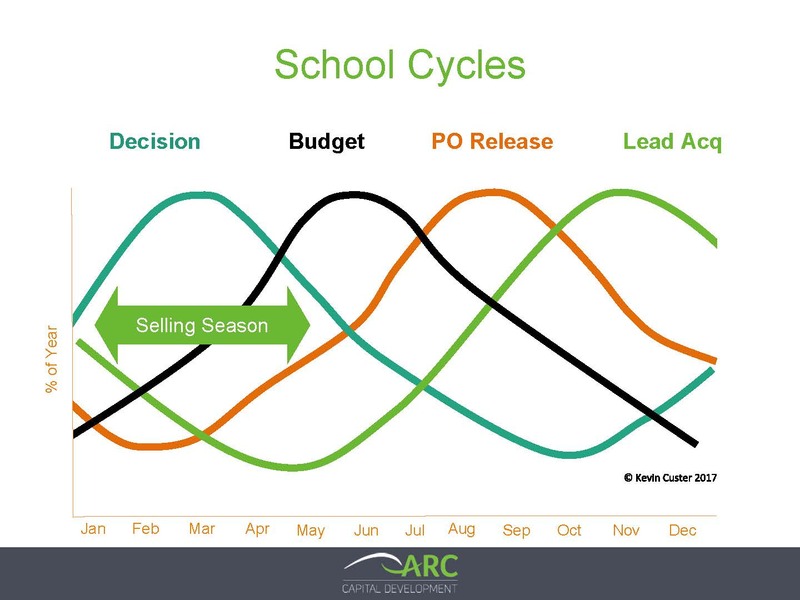 What was evident from her presentation was the importance of understanding the school cycle and selling season; “it needs to be owned by everyone in your organisation; all business and marketing efforts need to be informed by this cycle”. In the US, education is regulated and controlled by Government spending; “If you want to be effective, you need to understand how government budgeting works and sometimes even influence it”. To be an effective, long-lasting education company selling into the US, Rita highlights that your product or service needs to be included in the budget cycle; as “sales come from budget money”. Once you get into a budget, you will typically stay in that budget for many years. Primarily, all school funding given to school districts, be it Local, State or Federal level funding, is controlled through budgets, which are released between April and August. 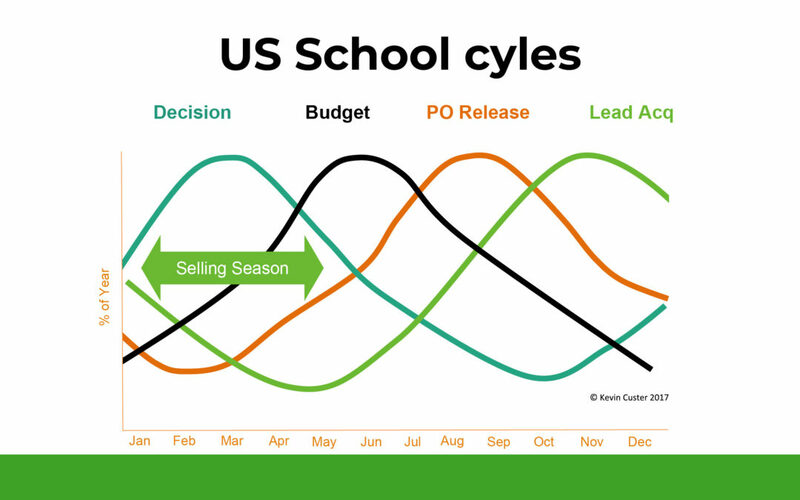 In the school cycles diagram, Rita highlights the selling season as the period where decision making is at it peak between January and May. The decision making cycle occurs before the budget cycle, as educators and decision makers determine what products they want to use in the following school year. It’s very likely that multiple people or a committee will be involved in these decisions which are then fed to the school officials who include in the budget. “If you miss this budget cycle, you have to wait a whole year”. Once the budget has been approved they release the purchase orders; which coincides with the start of the school year in August and September. To make it into this cycle your organisation needs to begin acquiring leads in the prior year. Rita highlights the ‘window of opportunity’ for lead generation is the period between the start of the school year in August and the Christmas break, a period of less than 85 days. “During this short time, and in order to be successful, you need to prospect, cultivate leads, and fill your pipeline to drive your sales year”. Companies that go out in January to acquire leads, are so far behind; because in January, you need to be talking to the people who are making decisions, know what they care about and what you can do to close the sale. Missing the School Selling Season has been known to bring down a company; and is why understanding and following this cycle is so important for new entrants. In this online session Rita Ferrandino provides an overview of the US K-12 education market offering practical advice for Australian EdTech businesses thinking of expanding to the lucrative US market. In this session Rita provides an overview of the US capital market offering practical advice for Australian EdTech businesses wishing to obtain capital investment as they expand into the US market. Rita Ferrandino has built an international reputation as one of the most effective strategist and coalition-builders in the education community. She is a recognised STEM education expert and authority on education policy and politics. Singapore, Hong Kong, China, Ireland, Turkey, Israel &amp; India. Arc clients and portfolio companies provide products generating over a billion dollars a year to schools worldwide. Rita currently serves as the President of Education Design Studio Inc. (EDSi), a private seed fund/incubator created in collaboration with the University of Pennsylvania’s Graduate School of Education. Rita serves as the Capstone Instructor for the Education Entrepreneurship at the University of Pennsylvania’s Graduate School.